Laugh for the Cure 2017 was a barrel of laughs and so much more. Susan G. Komen Charlotte would like to thank all those who attended and participated in the live and silent auctions. Thank you to the phenomenal sponsors and volunteers who devoted their time, talents, financial resources, and in-kind donations to make Laugh for the Cure a success. Comedians Craig Shoemaker and Jason Allen King kept the audience rolling in their seats with a hilarious PG-13 show. It is because of events like Laugh for the Cure, that Susan G. Komen is one step closer to its new BOLD GOAL: reduce the current number of breast cancer deaths by 50% in the U.S. by 2026. The money raised from Laugh for the Cure this year will help provide funding for over 585 mammograms for women and men who need financial assistance because they are uninsured or underinsured. This is a major accomplishment and we could not have done it without you! While there have been advances in breast cancer research and actions taken to promote preventative practices, men and women are still losing the battle to this disease. How can we help decrease the number of deaths related to late stage diagnosis? How can we make breast cancer treatment more affordable? How can we help families who are impacted by their loved one’s diagnosis? These are just some of the many questions that hold Komen Charlotte vigilant to its mission. Laugh for the Cure is a grass-roots breast cancer charity event that was founded in 2002 by Tammy Greyshock to remember loved ones lost, celebrate survivors, and help people currently impacted by the disease. Tammy’s mother and two aunts were diagnosed with breast cancer. 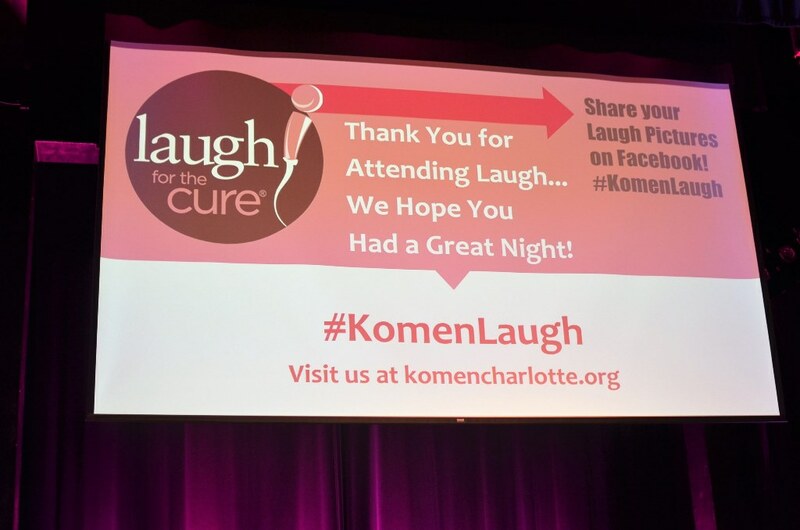 Laugh for the Cure is a signature Komen event that started in Charlotte 16 years ago, and has grown to include nine other cities where Komen affiliates are located. The results are a combined effort of 35 events and $2M raised. “We cannot stop our efforts until breast cancer is no longer a life-threatening disease. Events like this help share the message… and undoubtedly save lives,” says Tammy. We look forward to seeing you at next year’s Laugh for the Cure. If you would like to share your feedback from the event, please fill out our survey. This will help us with planning future events. As Komen Charlotte moves into a new fiscal year, we hope stories of survival will increase, new partnerships will be formed and renewed, and giving will increase. No financial gift is too small when it comes to educating the community, investing in research, and funding grants to support the critical needs of breast health services in our local area. Komen Charlotte thanks you for all you do! Last year, Susan G. Komen announced a “Big, Bold Goal” to decrease the number of breast cancer deaths by 50% in the U.S. over the next decade. A lot goes into accomplishing this goal, but the two main focus areas are disparities and research. Let’s take a moment to learn about disparities. What are disparities and why do they exist? Cancer disparities are differences in cancer outcomes among different population groups, which may include, but are not limited to, those characterized by race/ethnicity, ancestry, cultural factors, socioeconomic status, age, sexual orientation, geography, disability or other characteristics associated with social inequality or discrimination. There are many complex factors that contribute to breast cancer disparities. The most apparent factors are linked to medical care and a lack of health care coverage. However, factors affected by social and racial inequalities such as education, income and the quality of neighborhood environments are thought to play a major role in health disparities. Achieving health equity requires an intense focus on areas of greatest need, and nowhere is the need for health equity more critical than in the African-American community, where women are about 40% more likely to die of breast cancer than Caucasian women in the U.S. In some cities, the mortality gap is as high as 74%. This disparity is attributed to a number of factors, which include higher rates of early onset, more advanced stages of breast cancer at diagnosis and more aggressive cancer sub-types that occur within this population. Komen’s collaborative effort with civic, health, government and faith leaders to identify and implement the interventions they know to be most relevant in communities will help us accomplish our Big, Bold Goal and make an impact in breast cancer disparities. Over time, these findings will be implemented in more cities and towns across the nation. For example, with $2.6 million in funding from Komen, the Metropolitan Chicago Breast Cancer Task Force was able to reduce the mortality gap between African-American and Caucasian women by one third in five years in Chicago. This is proof that a collaborative, systems-oriented approach, along with determined communities, can and will save lives from breast cancer. Komen believes that where you live should not determine whether you live – and that all women should have equal access to quality breast health care. We are committed to fixing the issue and working to bridge the gap in access to high-quality health care to reduce the rate, and, ultimately, end breast cancer disparities. Join us in making a difference in breast cancer disparities! To learn more about disparities and how you can help, click here. In October 2000 my wife Jennifer Helen Ledford Sherrel and I married and celebrated our new life together with a two week vacation in Spain. The next spring, we placed a contract on our first home and looked forward to a bright future building a family together. With a promising career working as a registered nurse at Gaston Memorial Hospital, and a passion for helping others, everything seemed possible for Jennifer. Life took an unexpected turn 7 months into our marriage with my wife’s diagnosis of Stage 2 breast cancer, bringing anxiety and uncertainty to our well laid plans. For those that know my wife, almost nothing slowed her down for long. We proceeded with her mastectomy and breast reconstruction surgery (and closing and moving into our new home) all in a three-day period the month after her diagnosis! My wife returned home from the hospital in a wheelchair just in time to direct the moving team. Really, who has time for cancer when you have a life to live! After a few months of chemo, she received the “all clear” from our oncologist. Biological children weren’t advisable because the medication to prevent recurrence of the cancer would place any pregnancy at great risk. Undeterred, we returned home from Russia with our infant son Nathan in May 2003. Jennifer returned to her nursing career, and even found new professional opportunities which offered an ever-expanding promise of personal fulfillment. Life seemed to be back on course, and our problems were in the past. The next spring, my wife had a recurring pain in her back which worsened gradually. The pain eventually became intolerable and in June 2004 she visited the urgent care. The ultrasound brought unexpected and horrific news – Stage 4 metastatic cancer to the liver and bones. Thus began our true journey. When faced with Stage 4 cancer, you want to be sure you are pursuing the best treatment options available. In January 2005 we visited Johns Hopkins for a second opinion. The doctor measured his words, but only for a moment. We hadn’t driven eight hours for a pleasant chat, and my wife wasn’t one to settle for evasive medical advice so she pursued until he laid it out clearly: (1) our oncologist was on point with every treatment protocol and (2) she had 2-6 months to live. Armed with that news, Jennifer retreated only briefly then charged back defiantly. First, it was off to the presidential inauguration ball and then home to organize a team of prayer warriors to complement the next wave of chemotherapy. Over time, the prayers were answered and by March 2006 the blood tumor marker readings had returned to normal levels – my wife’s cancer was miraculously in remission! Truly, this was a real miracle for as any medical professional knows a cancer that has spread to the liver simply does not leave – save for a liver replacement which in Jennifer’s case was not available. For the next four years the disease was held in check primarily with an estrogen blocking medication having minimal side effects. We were able to travel frequently and have a relatively normal life aside from the frequent visits to the oncologist. During this period, in 2007 my wife organized a fundraiser called Oysters on the Lawn which served as a springboard to greater heights for the local nonprofit organization Carolina Breast Friends, an advocacy and support group for breast cancer survivors which operates near uptown Charlotte from a Pink House (fulfilling the vision of the organization’s founder), giving hope and support to so many survivors locally. Over time, the cancer evolved and by 2010 it charged back with a vengeance in the liver, lungs and bones. From that point forward there were constant chemotherapy treatments, CAT scans, PET scans, four liver stint replacements, surgery to remove a cancerous gall bladder, fluid drained from her lungs and liver countless times, more nights in the hospital than we can remember, and life threatening infections. The cancer ebbed and flowed, growing in an area then retreating in response to treatment. We tested nearly every imaginable boundary of the medical advances that have been made in cancer treatment. We discovered right here in Charlotte, NC what a remarkable world class medical community exists on every angle. Certainly, we owe a great debt of gratitude to Dr. James Boyd and his team at Oncology Specialists of Charlotte who have been absolutely remarkable at every step. Through it all there was LIFE, abundantly! In between the treatments, there were great family trips to places near and far. Europe, the Caribbean and Bald Head Island, North Carolina were all favorites for Jennifer and her family – often all three locations in the same year. Usually, good friends would accompany us on our vacations and bring awesome memories. Jennifer loves to scuba dive, and even with all of her treatments did not let it stop her from doing the things she loved to do! Life is more than just fun trips, as everyone knows. Jennifer continued to be an awesome mother to our son Nathan and involved herself in every aspect of his life. She nurtured Nathan and mindfully, proactively anticipated his every need – placing people in his life to be there whenever the time might come that they could help him adapt to changing circumstances. But most of all, Jennifer placed her faith and trust in her Lord and Savior, Jesus Christ. Regardless of her circumstances, she leaned on Him for her every need and surrounded herself with prayer warriors and people of faith to support our family on this journey. More to the point, even as the journey and her health situation worsened she stepped up her faith AND praise for her Savior exponentially…and always with a genuine warmth and smile. Even beyond that, she lifted up others in prayer and always placed their needs and concerns high on her list. She was a true friend to many, and touched countless lives. Fast forwarding to January 2016, my wife had surgery to insert specialized radiation beads directly into her liver to eradicate the disease. This is a recent advancement in medical technology which is now being introduced for metastatic cancer in the liver. We were quite hopeful that this would be the turning point in her recovery as the cancer had largely retreated from elsewhere in her body. While it seemed clear that the radiation treatment itself was having good effect, we would soon discover that elsewhere in her body the cancer was advancing at an accelerated pace now. Ever mindful of her husband, she nominated me to be a Pink Tie Guy at the 2016 Komen Charlotte Laugh for the Cure. This highly anticipated annual event originated in Charlotte, and the Pink Tie Guy awards are given to local men who have been great supporters of breast cancer locally. It is also a great time to catch up with the large community of friends that have been affected by this disease. Here the story of Jennifer Sherrel takes a dramatic and remarkable turn. On Thursday March 10, 2016 the Komen Charlotte Laugh for the Cure event was held, although Jennifer was unable to attend. She was mentioned prominently at the event, lifted up as an example of courage and resilience. That very night, Jennifer’s health took one last dramatic turn for the worse and she was admitted to the hospital the next day. 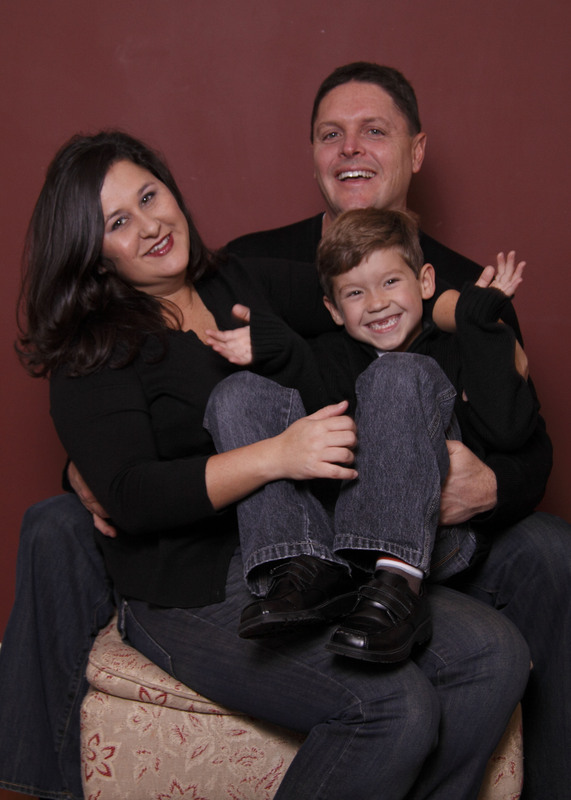 The news was devastating, as a subsequent MRI showed metastatic cancer to her brain. Jennifer had always said that the one path she didn’t want to traverse was an end stage cancer in the brain. In a way, she would still get her wish as end stage liver failure was in full force already. Jennifer and I shared precious moments in the hospital room that Saturday morning – holding each other closely, professing our eternal love for each other and gratitude for our perfect journey together. I think few people in this world get the opportunity to truly say their earthly goodbye, and let me tell you how magnificent that experience can be….if you have long ago placed your trust in Jesus. So on Wednesday March 16, 2016 just a few minutes before noon Jennifer Helen Ledford Sherrel went to be with the Lord. Yes, there is a tremendous emptiness left by her passing which for me and our son Nathan will never be filled completely. So many friends also have an incredible void in their lives as well. Everything is so raw now, fresh and probably even with a hint of denial. The mourning that I feel personally is beyond anything I could imagine. This journey of 15 years, I never dreamed it could turn so quickly. In fact, we had always lived with great hope that this would be merely a chronic illness that she would battle through until that breakthrough cure finally arrived. We are never promised tomorrow, and are reminded yet again to live each day with purpose. I pray that Jennifer’s spirit, passion, energy and faith in Jesus continue to live inside all of us. We all have but a few years here on earth, but an eternity to look forward to with our Savior. Jennifer’s lasting wish, which she spoke of often as we were alone together – and the real reason she courageously lived a life with such passion and purposeful example – was to see all of her friends again one day in eternity. To everyone at Susan G. Komen Charlotte, thank you for honoring me as a Pink Tie Guy and providing the opportunity to share the amazing story of my wonderful wife, 15 year breast cancer survivor and now an eternal Dancing Queen, Jennifer Helen Ledford Sherrel. It was never “why me”, but often, “how could it be me? I ate organic foods before eating organic was the popular thing to do. I avoided VOC’s (volatile organic compounds emitted from paint, composite wood, upholstery fabrics, and many more products), removed my shoes before entering my home so as not to track in bacteria and toxins, and I installed HEPA filters throughout my home. I exercised daily and was slim and fit. I had only a distant family history of cancer. If there is a reason as to how it could be me (and all the genetic testing has not given me a reason), I would say it was stress. Not major, catastrophic stress; just the accumulation of the little daily stresses that make up a full life. If I could impress upon you, any and all of you, learn today to deal with your stress. Find the peace, serenity, and calm you need to live in the moment and enjoy the present – for today is truly a gift! My diagnosis occurred after the self-discovery of a lump, undetected by a mammogram and physical exam three months prior. I had dense cystic breasts and avoided self-exams because I was uncomfortable with the lumps and bumps I felt. I had numerous biopsies in previous years because of calcifications. So why did I feel this lump and decide it was important to have it looked at? Timing and luck. I was in New York right after Super Storm Sandy, taking care of my mom who had just gone through an unexpected emergency surgery, when I felt the lump. At another time I would have ignored this lump, but helping Mom deal with her physical emergency while the State of New York was reeling from its natural emergency, made an impression on me. When I got home to Colorado, I went to see my gynecologist. The doctor sent me to the hospital for a diagnostic mammogram and ultrasound which I did the same afternoon. The doctor at the breast clinic who performed these diagnostics felt quite certain that what we were feeling was merely another calcium deposit but he advised I return the following week and have an ultrasound guided biopsy, which I did. He called the next day with my diagnosis: grade 3, stage 1, triple negative (ER-, PR-, Her2 -) invasive ductal breast cancer with a Ki-67 rate of 84%, a very aggressive cancer. (Ki-67 is a protein in cells that increases more rapidly the more aggressive the cancer is. Most breast cancers have a Ki-67 rate of less than 15%). I saw the surgeon a few days later, and had a bilateral mastectomy the following week. I began chemotherapy three weeks later. I’m now two years with no evidence of cancer. I feel wonderful and very grateful to have had access to the excellent medical care that enabled me to fight this disease. I will always be grateful for the love and support showered on me by my family and friends. Their strength and comfort guided me through the most difficult times and brightened the easier days. My husband, David, never waivered in his love and devotion. His care and concern embraced me every step of the way. He helped me tackle each new obstacle, from shaving my head to emptying my surgical drains to carrying me out of the bath tub, and we laughed and cried as one. He rose to the occasion as not many could and I thrived because of his love. He made me feel (and still makes me feel) feminine and beautiful and perfect! My son, Jesse, just 17 at the time of my diagnosis, handled my pain, my tears and my baldness with loving acceptance and humor. He brightened my darkest days and showered me with unconditional love. My mom, Evie, stayed with us while recovering from her own surgeries and trauma and brought joy to each day. She lifted my spirits, eased my burdens, and loved me the way only the most loving of moms could. She kept our family running smoothly and seamlessly joined our daily life. Our nightly games of Scrabble kept my mind busy and distracted. My dad, Roger, made the journey from diagnosis through surgery and chemotherapy with me – by phoning every single day and “counting down” the days of treatment ahead of me and behind me. He never missed a day, and his calls brought comfort and normalcy to very scary times. During a wonderful post-chemo vacation to Disney World with my family, I was given a button to wear from the hotel staff that said “I’m Celebrating being Cancer Free!” Walking around Disney World proudly wearing my button on my post-mastectomy chest, with a colorful scarf on my bald head, I was approached daily by strangers who wanted to congratulate me, hug me, share their own cancer stories with me, tell me how happy they were for me, tell me how proud they were of me, and sometimes even cry with me. This outpouring of love was the most emotionally curative experience! I was so touched, so moved, and so loved – by strangers. With a heart full of love – I thank you all! What Happens Now That Race Is Cancelled? It has been a difficult few days for the Komen Charlotte team and we are sure it has been for many of you as well. The Race for the Cure is the Komen hallmark and usually our proudest moment. This year, Mother nature had her own ideas about that. Because we take the safety of our volunteers and race participants seriously, and after close consultation with local weather experts and receiving a stern recommendation from the CMPD we decided it was best to cancel Saturday’s activities. It was one of the hardest decisions anyone of us on the team has ever made, but we know it was the right one. Needless to say we were extremely disappointed, as much as or more than anyone. We love bringing the Race for the Cure to our community. Our staff and volunteer committee work all year to bring you a special experience. The Race brings us all together to honor and celebrate survivors, and raise the funds necessary to provide breast health services and education to those in need. While the race will not occur this year, the commitment to help our neighbors is always top priority. We will continue to reach out into the community and help wherever there is a need. If you were registered for the race or made a donation, thank you for your support. If you are a sponsor or contributor to the Race, we know that you invested your philanthropic dollars to support the Komen mission to save lives and end breast cancer forever and we will do everything we can to give you the recognition you deserve. We will put your contributions to work in our community and we will come back and share with you how it was done. We particularly want to thank Novant Health and Mecklenburg Radiology Associates for your continued partnership and the trust you put in our organization. It is through your yearly commitment that we are able to create the Race day that has become Charlotte tradition, and from there go on to fund the important work being done to help breast cancer patients in our community. Be assured 75% of net funds raised are put to work right here in our 13 county service area while another 25% supports critical breast cancer research at the national level. Your donations make this work possible. The board of directors and staff of Susan G Komen Charlotte want to thank all of you for your ongoing friendship and we look forward to bringing the Komen Race for the Cure back next year. Again, we appreciate your understanding. For the Cure….together in pink. The Race was cancelled, now what? A. You can come to our office during this week (Oct. 5-9) during regular business hours from 8:30 p.m. – 5:00 p.m.
Can my Race packet be mailed if I am able to pick it up? A. Yes, the cost is $8 postage per packet. Call our office and speak to Jacquie Pinder, Office Manager. When will my Race packet be mailed if I choose this option? A. We will start mailing packets out by end of the week (Oct. 9). Can I get a refund for my $35 registration fee? A. As set forth on the Race participant entry form, no refunds will be given for Race registration fees. Please be assured your registration fee will be used as a donation to support the organization’s efforts to help local women and men and to fund critical research. Can I still make donations toward my team or individual fundraising goal? A. No, the Race will not be rescheduled. The next Race for the Cure will be Sat. Oct. 1, 2016. If I am a Survivor will I receive my gift/goody bag? A. Yes, we will send out communications via email, once we have a plan in place. Whether you are training for your first 5k and just want to cross the finish line or you are an experienced runner and you want to improve your time, here are some helpful tips to keep in mind as you train. Do you have the right running shoes? Running shoes are not all made equal. If you haven’t been to a specialty running store and been “fitted” for a good pair, I would highly recommend it. Have a training plan! This will help you set your schedule and plan around the days you need to run. There are many free training plans you can find online that are very good. Do you have a running buddy? I have found it very helpful to have someone to train with. When you have someone to train with it helps to keep you accountable and less likely to skip that run. Also keep in mind that your running pace should be comfortable enough for you to carry on a conversation. If you want to increase your speed there are several things you can do. The first would be speed intervals once a week. Simply put, speed intervals are running sprints. If you have access to a track you can run a lap, typically 400M, at an increased speed from your normal 5k time, walk half a lap, repeat 4-6 times. You can gradually increase the amount of laps until you reach 14. If you don’t have access to a track and you are a road runner like me, than I suggest running sprints from light pole to light pole. No one typically loves running hills, but hill work is a great way to improve your time. Running hills helps to build leg muscles and helps with aerobic capacity. When you run hills be sure to keep your stride short and pump those arms to help drive you up the hill. I would recommend hill training once a week or find a good course on your normal run that includes some hills. Another way to increase your speed is to increase the distance on your long runs each week. Increasing the distance will help to build endurance. Long runs should be run at a slower pace than your 5k time. When you increase your distance you should only increase the distance by no more than 10% from the week before. You can increase the length to 5-6 miles or longer if you wish. After running these longer distances you will feel good about running a 5k. Don’t forget warming up before a run is just as essential to the run itself. And don’t skip the cool down portion of your run either. The cool down run will teach your body to press on when it’s fatigued. And last but certainly not least, I suggest eating a good well balanced diet for performance. And don’t forget that after run snack that is high in protein to help your muscles recover. Susan G. Komen Charlotte is honored to be part of this fabulous week of fun and service hosted by our partners at BCC Rally. We cannot thank the members of “Rally” enough for the strong collaboration and friendship we share all year long. Our relationship is a true example of a shared vision and common goals. All of us together, fighting to save lives and end breast cancer forever. To all of you participating in Rally week, Komen Charlotte appreciates your continued generosity. We know each year many of you come out to participate in Rally Week as a way to demonstrate your personal support and we applaud you for exhibiting exemplary community support. Every time you donate to Rally, you donate to Komen Charlotte and to lifesaving breast health services and education. Since 1997 Komen Charlotte has funded more than $14 million in local programs and over $5 million in breast cancer research. This year’s grants totaling over $1.1 million, specifically address funding for cancer screening and diagnostic mammograms, treatment assistance, and education programs across our 13 county service area. You can be assured that your donations to BCC Rally are helping people right here in our community and literally thousands of people are served because of your gifts. I encourage you to visit our website at www.komencharlotte.org to learn more about the services your donations make possible. Komen Charlotte and BCC Rally are on a Mission. Together we will educate, empower, and ensure quality care for all, and along with 114 Komen sister affiliates across the world, we will continue to energize science to find the cures. BCC Rally makes it possible for us to stand strong in our commitment to serve the uninsured and underinsured in our community. Contributing more than $1.2 million to Komen Charlotte over the years, BCC Rally has become the largest and most important Rally organization in the country. Simply amazing! When you consider the average cost of a mammogram is $250, potentially 8,000 people received a lifesaving examination or test because BCC Rally cared. There’s no greater measure of success or more important mission than saving lives. Every two minutes someone in the US is diagnosed with breast cancer. That’s a difficult statistic to hear and we must stay the course to create a different future, to fight cancer and find hope. With ground breaking research underway right here in North Carolina, and top notch grantees working to navigate so many through their journeys, we will find a way to beat breast cancer and win! BCC Rally will help lead the way. The Board and Staff of Susan G. Komen Charlotte are extremely proud to be in partnership with our good friends at BCC Rally. Good luck with Rally week and enjoy the success around you. Visit BCC Rally website for schedule of events! Each year at the Komen Leadership Conference in Dallas, TX, affiliates come together to learn new things about the direction of the organization, engage in professional development workshops and celebrate and award the people who work so hard around the country to further Komen’s mission. Each year, affiliates can nominate one of their own for the Outstanding Volunteer Award. This year, we nominated Carol Aaron. We would like to share the submission we sent, and thank Carol publicly for all the work she has accomplished over the years. Carol Aaron is known affectionately as the “Pink Bow Lady” at the Charlotte affiliate and around the breast cancer community. She is a visionary leader who has grown the “Pink Bow Campaign” from a simple neighborhood awareness campaign which raised $500 for Komen Charlotte, to a $300,000 fundraising powerhouse crusade. Carol is a pretty, petite and outgoing woman with a dynamic personality, an infectious laugh and the ability to sell a pink bow for far more than its original value. It all started during Breast Cancer Awareness Month 2007, when Carol found a pink sash placed on her mailbox at her Ballantyne Country Club home in Charlotte, NC. Carol thought it was pretty, and a nice visual symbol for the cause. She learned more about the group of women in the neighborhood who were raising money for Komen Charlotte. She immediately became involved, took over the “pink bow” effort, and it quickly became her passion. At the time, Carol felt that the pink bow campaign was a nice way to honor her mother-in-law, a two-time breast cancer survivor. She set her sights on canvassing the entire neighborhood the following year, selling pink ribbon bows that she hand cut on her kitchen table. Pink bows are “sold” for a small donation price of only $2 for a small size, $5 for medium and $7 for a large. Word spread quickly as pink bows became iconic symbols throughout the neighborhood. One neighborhood of bows turned into two, and then several more got involved. She raised $5,000. Over the past eight years, Carol has grown the program with the support of the BCC Rally and sponsors, whose financial contributions offset the cost of bow production which now is done through a company in China. She personally redesigned the bow to stand up and hold its shape through rainy weather, and today approximately 50 neighborhoods in the Charlotte area participate each year. Approximately 30% of the money raised through “sales” of pink bows consists of donations far above and beyond the bow “price”, making it a lucrative endeavor for Komen Charlotte as the benefactor. Last year, donations from the Pink Bow Campaign equaled an amazing $83,000, contributing to Komen Charlotte’s ability to fund $1.1 million in community health grants (for 2015-16). “It morphed into an amazing project and I continue to be excited about growing it further,” said Carol who admits it is a full time job, especially during the months leading up and following Breast Cancer Awareness Month. Carol says that honoring her mother-in-law was the catalyst for her involvement, but over the years her passion has been fueled by meeting new people, hearing scary and courageous stories from survivors and by the hope that her children may never have to worry about getting breast cancer in the future. “I have made incredible connections with people through this project and I feel like it is a wonderful visual that creates and maintains an awareness that is so important,” she said. Carol inspires others to get involved by training them well, encouraging them, being accessible to help and offering a “tried and true” process that makes it easy to implement. Her volunteer corps is 150 strong and consists of men, women, and even school children, who find the pink bow campaign to be a fun and easy way to promote the cause. She created materials that are sent via e-mail and can be downloaded, personalize, and used immediately. Her volunteer retention rate is high, as most team members come back to her year after year with new and loftier goals. “My Neighborhood Bow Captains set new goals and exceed them every year,” boasts Carol, who credits the success of the program to all of the dedicated volunteers who implement it in the field. People like it, says Carol, because they can raise money for the cause without paying anything out-of-pocket or having to come up with brand new ideas. She also hears about the confidence and satisfaction that people feel when they succeed with their bow campaigns. “Most importantly, they are assured that 100% of the donations will go directly to Komen Charlotte which is important to people who are working for a charity,” states Carol. As the program grew from neighborhoods to school classrooms and office buildings, Carol approached Komen Charlotte to find out how the Pink Bow Campaign could benefit Race for the Cure participants who were always looking for unique fundraising ideas. Today, Carol participates in all Race team captain meetings and instructs them on how they can buy bows at a discounted rate and use them as a fundraising tool. Any proceeds raised are allocated to the team’s fundraising totals and are donated to the affiliate through the Race event. Last year, team fundraising accounted for 87% of total Race revenue ($800,000+). Carol’s Pink Bow Campaign also benefits Komen Charlotte’s third party events. Carol and her team are always on stand-by to participate with third party organizers who want a Komen presence at their events, and they love the additional fundraising aspect. Carol and her team have participated in several events over the past year such as the Pink Game with the Charlotte Hounds Lacrosse Team, the Charlotte Observer’s Pink Lunch, the Coca-Cola 500 Fan Fest, Community Corner night at the Charlotte Hornets games, and the Southern Women’s Show.